A sensual massage oil with a rich aromatic base, perfect for soothing away fatigue and tiredness. 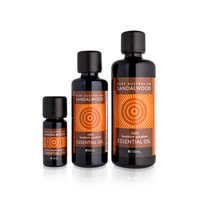 Pure Australian Sandalwood oil encourages the calming of the mind and body, while a gentle massage releases tensions, anxiety and muscular tightness. A special oil dispersant has been included in the formula, making this massage oil easy to remove from skin and also suitable as a bath oil.